"Modern Luxury at Modest Cost. Concert Tonal Quality"
The above quote was taken from a 1957 ad for this glamorous Admiral 7M14. 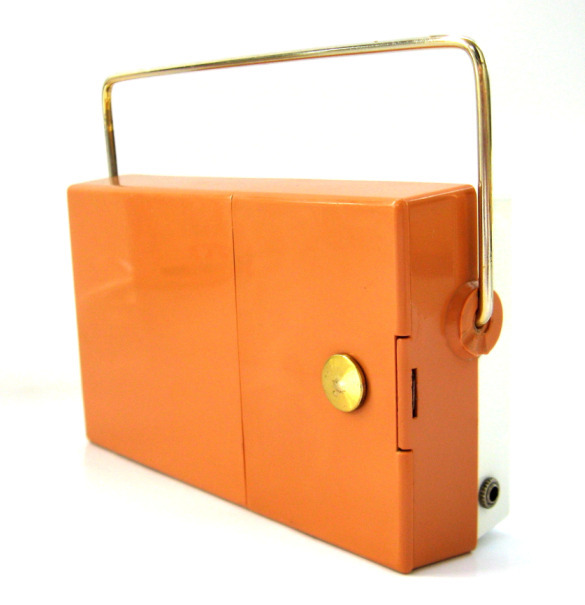 It is an American classic, an icon of the Golden Age of transistor radio design. It was made in the USA circa 1956/57 during the twilight years of the once great American radio industry. In a few short years the domestic American market would be overrun with imports from the Far East, and quality American made radios such as this would be few and far between. By the end of 1963 there were no American shirt pocket sets being made with all-American parts. 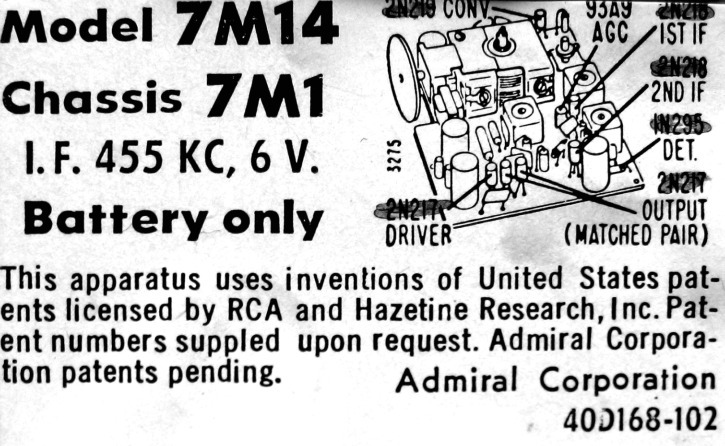 The earliest advertisement that I've seen for this Admiral is dated December 20, 1956 in the Milwaukee Journal. Meyers Department Store was selling it on sale for $59.95. I've seen a later ad in the Milwaukee Journal dated July 12 1957. In this ad the 7M1 series was offered for $64.95 in a gift box with a leather case and earphone. 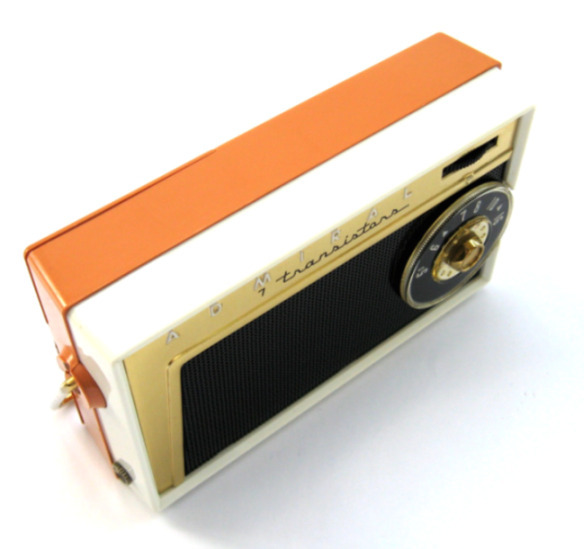 This 7M14 is a stylish looking radio. 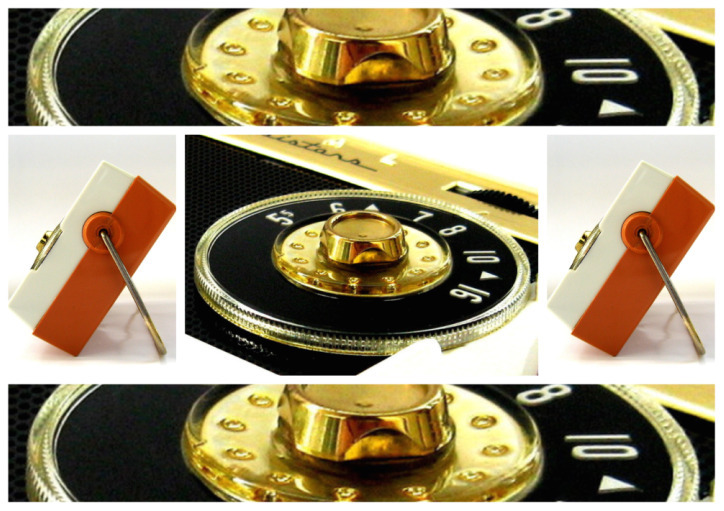 It features a fine under-painted tuning dial with gold accents. 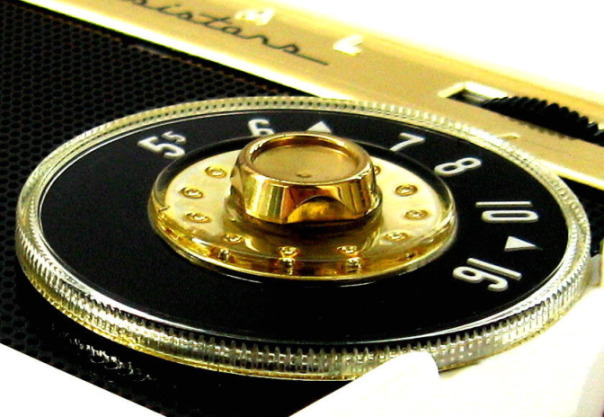 The speaker grill is painted black and the top and left surround is gold metal. 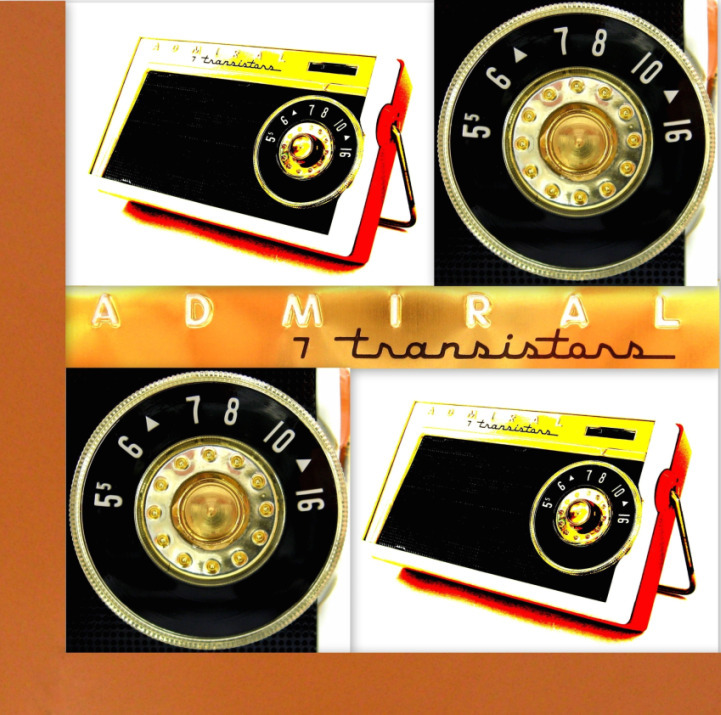 Admiral is stamped on the metal surround in white with '7 transistors' in black. The case is two tone white and tan. The 7M1 series was released in five colour combination's: 7M11 black, 7M12 two tone red & white, 7M14 two tone tan & white, 7M16 two tone yellow & white, 7M18 tow tone white & turquoise. Admiral used this cabinet on four radios released between 1956 and 1959. 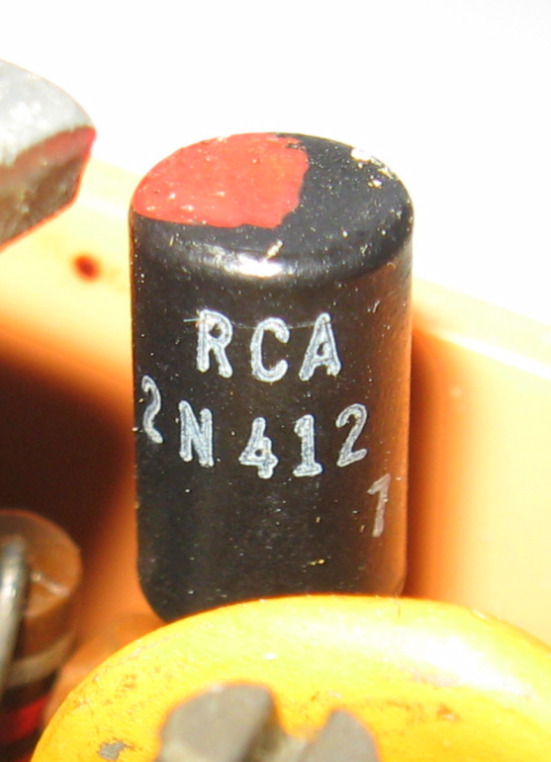 The seven transistor 7M1 series from 1956/57. 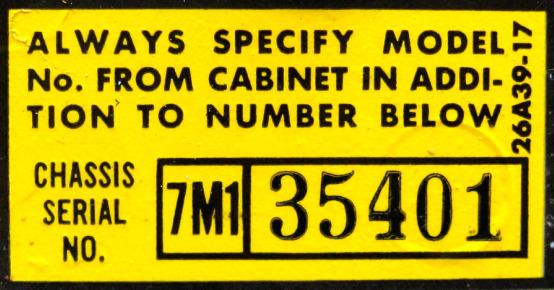 The 5 transistor series 581, 582 advertised in 1958 for $29.95. 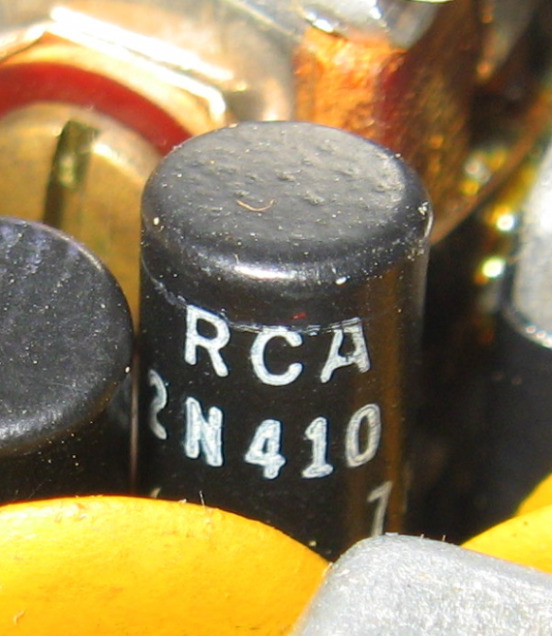 The 4 transistor series 4P21, 4P22, 4P24, 4P28. 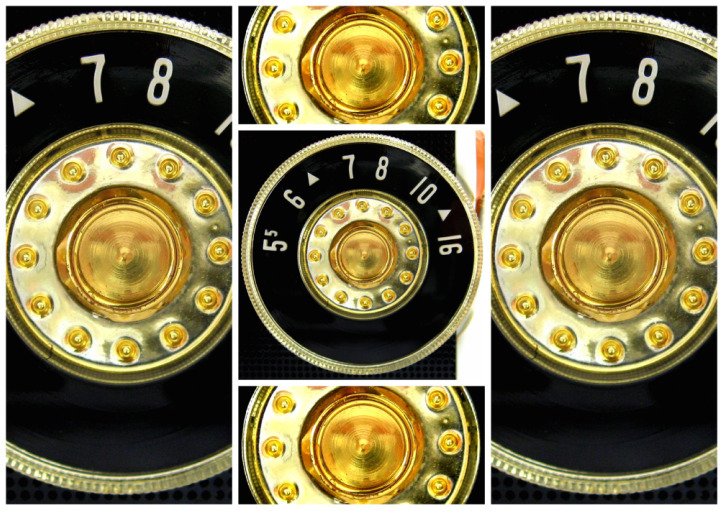 The 8 transistor series 801, 802, 808 advertised in 1958 as "New! 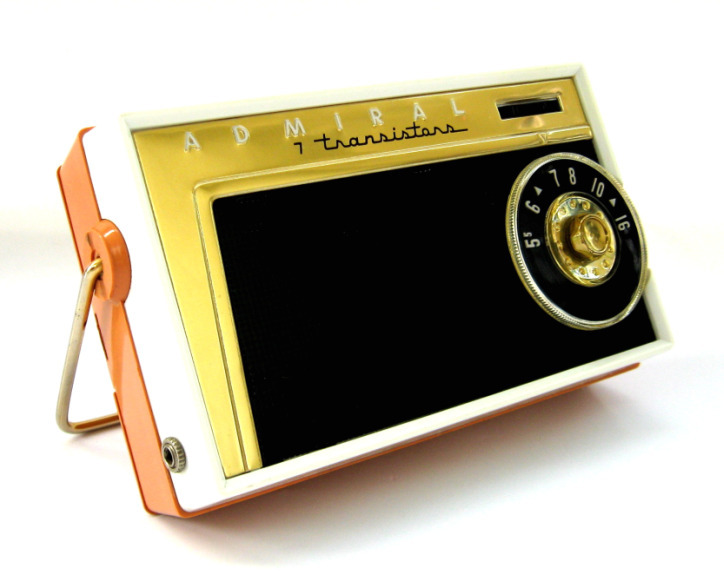 1959 Admiral 8-Transistor Pocket Portable" on sale for $49.95. 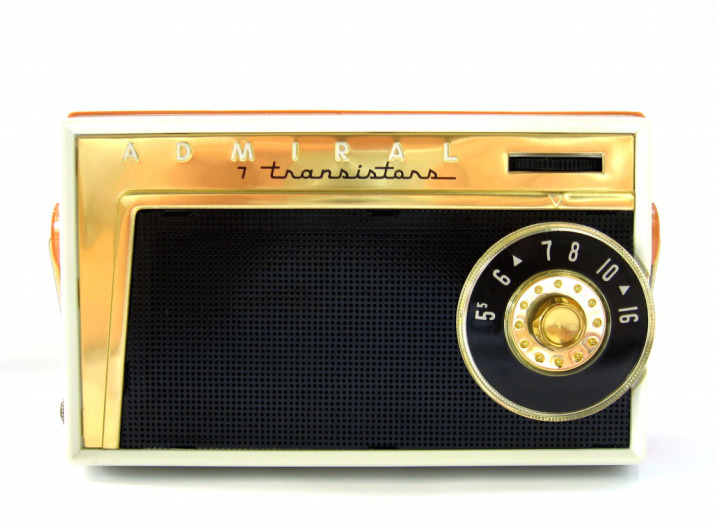 Admiral Corporation was originally founded in Chicago in 1934 as the Continental Radio & Television Corp. 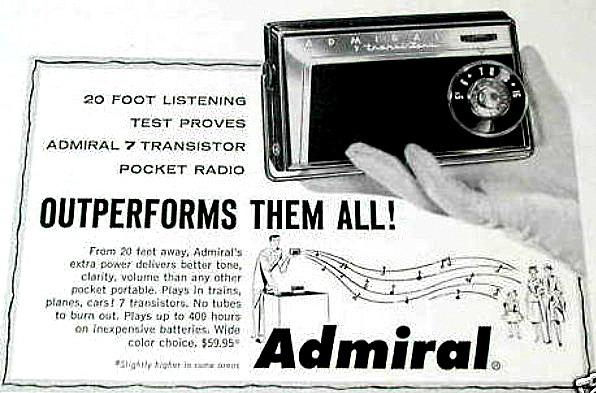 They later changed their name to Admiral Corp. During World War II Admiral supplied the US military with electronics. Admiral was one of the leading manufacturers of televisions during that mediums infancy. 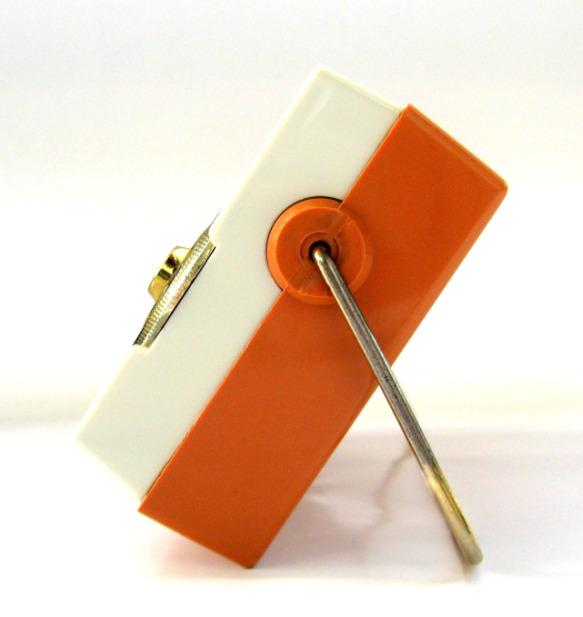 During the 1950's Admiral branched into other areas of consumer electronics such as refrigerators. 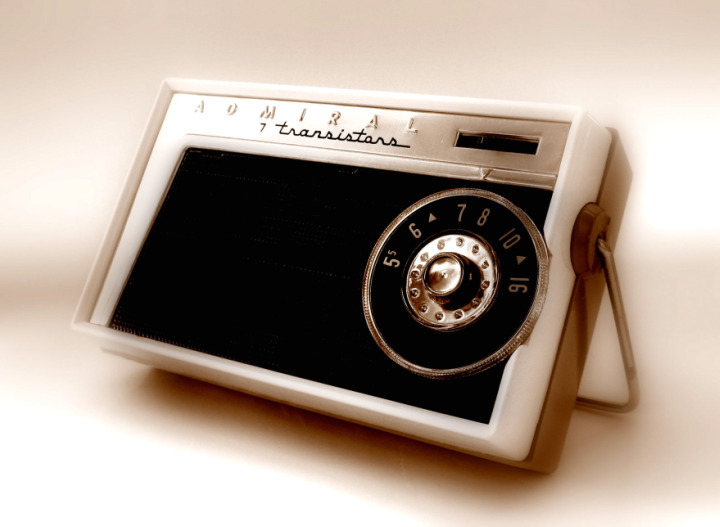 In 1956 Admiral released the worlds first solar powered transistor radio. 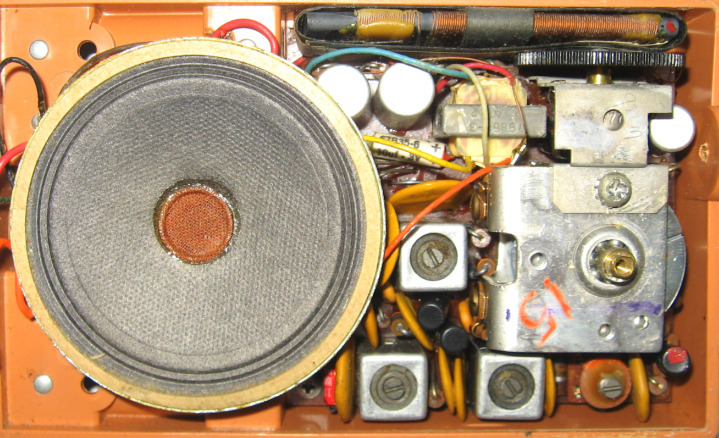 The 7L1 series operated on 6 D cells or the optional 'sun power pak'. 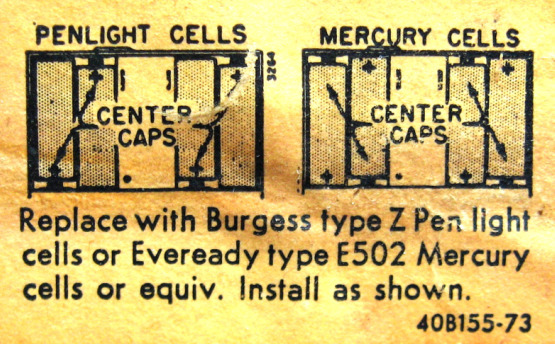 This power pak consisted of 32 'tiny' cells of pure silicon and measured 4 x 7 x 1 inches. It sold for $185.00 and Admiral put this high price down to the cost of pure silicon which at the time sold for $300.00 a pound. By the early 1960's Admiral Corporation employed 8500 people and annual sales approached 300 million. During the 1970's the various divisions of Admiral were sold off in part due to aggressive competition from the Far East. This ad appeared in a 1957 edition of Sports Illustrated Magazine. Pictured is model 7M11 of the 7M1 series. 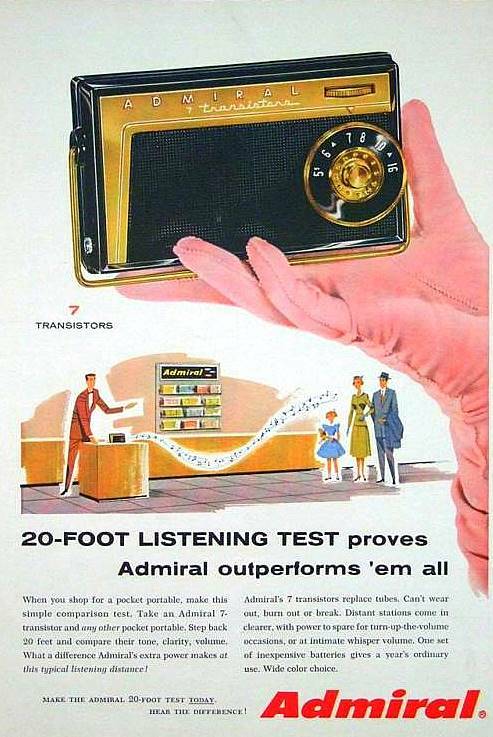 You've got to love the '20 foot listening test'! 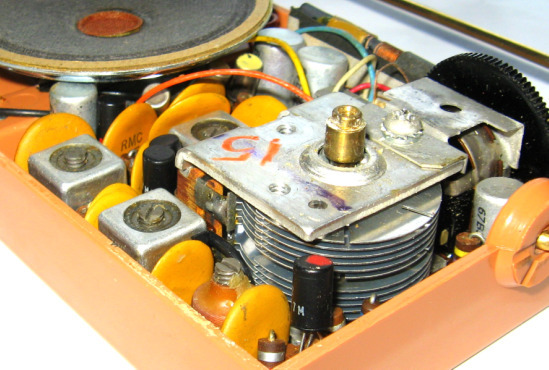 This Admiral makes use of 7 RCA transistors.